My employer lowered his eyes as he looked at the paperwork he brought upstairs for me. "We had two complaints from customers in the last few days about your cross. You'll have to take it down." I (used to) have a small white plastic cross on the bulletin board behind my main work area. I found it on the floor of my department three years ago and just stuck it into the bulletin board along with the assorted miscellany of product info, phone numbers, customer special orders and company policy. I saw it every work day but, as it was very much part of the landscape, sometimes didn't notice it. When I explained the circumstances to my employer he was greatly relieved "You mean you found it?" Yes. Throughout the remainder of the day as my employer flies (I do mean 'fly'!) through my department we had an interesting discussion on tolerance. My employer's family-run business has a been a fixture of the downtown for 86 years. This means he has a lot of stories that he's willing to share. My employer believes that society is becoming more tolerant of differing beliefs. I'm not so sure sometimes. I told my employer that at 43 I feel like I've seen so much that very few things surprise me anymore. 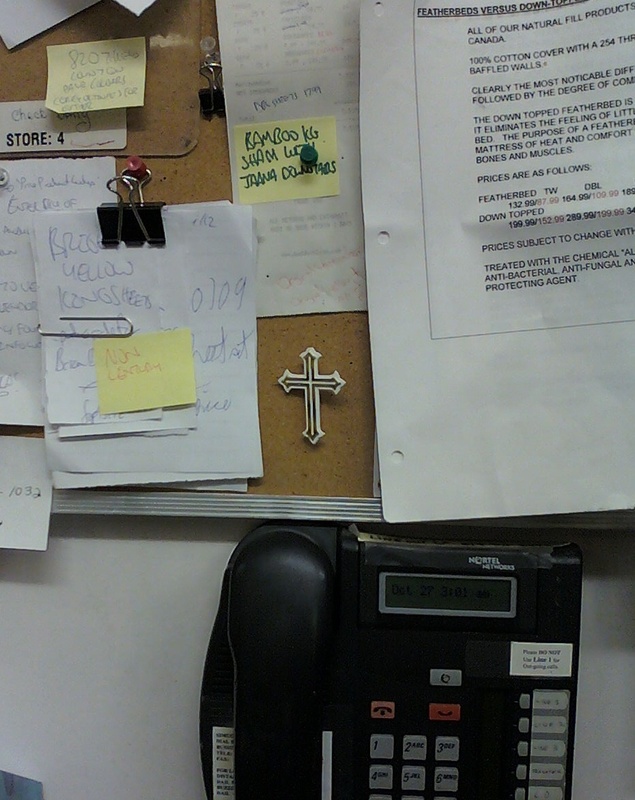 The reaction to the cross on my bulletin board struck me a couple of very different ways. I don't feel angry but irritated and I also grieve the loss of an opportunity. I wear a cross or saint's medal to work everyday, have the words dei gratia (latin for 'by the grace of God') inked prominently on my lower right forearm and wear Jesus charms on my work watches. In my work environment, when you look at me you are looking at religious symbolism somewhere. I don't shout my heart's beliefs or preach them: I breathe them. My customers complaint represents a lost opportunity to simply chat. When I had my dei gratia tattoo done three years ago the studio walls of the tattoo artist were decorated with anti-religious cartoons and a mask of a demon. My tattoo artist was a wonderful man who loved his father, had an interesting journey in careers and had some very legitimate issues with mainstream Christianity. He did most of the talking. I listened. I agreed with most of his points as his views paralleled some of my own experiences and observations. We chatted. Mutual respect. (and he did a great job on my tattoo!) This is the kind of interaction I would have liked to have with the customer who complained about the cross. Societal progress to me means there is room for everyone of every imaginable opinion and belief system. This is the beauty of multiculturalism (besides the great restaurants! ): there is room for everyone. Yes, you don't have to agree with everything someone is saying but a society that welcomes all works best with mutual respect. Tolerance is not about 'yeah I put up with you...' in a begrudging manner with a nasty undertone. And maybe tolerance is not even the best word for this! Maybe I am simply talking about human respect. In my 43 years I have seen the very best and the very worst in humanity. But I carry great hope for us. I believe that we are all 'big enough' in mind, heart and spirit to interact and engage with each other and to reach beyond ourselves to the person next to us wherever we are: at work, school, in the shops, buses, streets, coffee shops, our online communities, our neighbourhoods, our walking trails, our facebook/twitter/linkedin contacts, our community involvements, etc wherever we may find ourselves. My reading of Christian scriptures and my faith walk tells and challenges me to accept every human being as a special creature loved by God. And I see every creature, great and small, who crosses my path as a gift and blessing. Reaching across our own boundaries can only create healthier communities and break down the walls that divide too many of us. A very happy All Saints Day to all of you saints reading this! Posted by Joyce L. Young at 11/01/2012 10:39:00 a.m.